Motivated to rock your socks off! 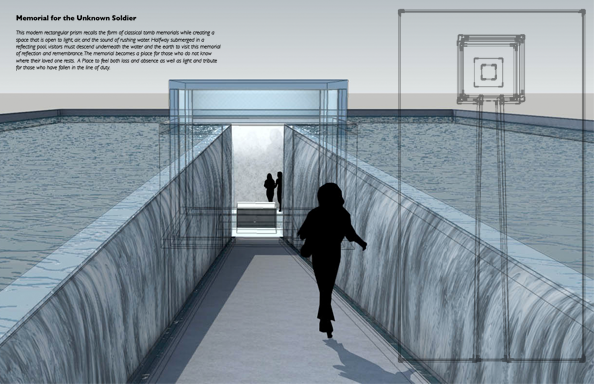 This modern rectangular prism recalls the form of classical tomb memorials while creating a space that is open to light, air, and the sound of rushing water. Halfway submerged in a reflecting pool, visitors must descend underneath the water and the earth to visit this memorial of reflection and remembrance. The memorial becomes a place for those who do not know where their loved one rests.A Place to feel both loss and absence as well as light and tribute for those who have fallen in the line of duty. My good friend Davina and I entered into a competition last May called the Memorial for the Unknown Solider. We used this opportunity to both work as a project lead and intern, submitting two different projects for the month of May deadline. 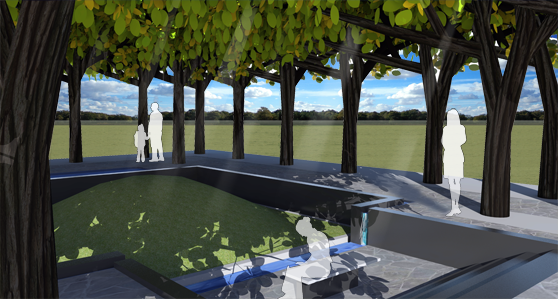 For this post, you will get to see my distilled vision for a memorial with another post to follow that highlights our other collaborative venture.